Samba shares are useful for various reasons. They allow you to access a directory over a network from any device running virtually any software. 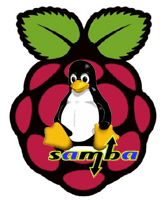 You can create a samba share on your Raspberry Pi and make it available to Windows, Mac OSX and Linux machines. You can even access them on Android and iOS devices (iPhones). This will allow you to manage your media library from any device in your home so you can copy movies or TV shows onto an SD card or usb stick to take with you on a long trip. If you are running XBMC you can add the samba share as a movie or TV library and play the files over your home network. If you have two Raspberry Pis you can use one as a media server sharing files to Pi number two running XBMC Kodi with Raspbmc. This will only take about 5 minutes and will make life far more convenient. If you are trying to figure out which hardware would work best for you, consider reading the Pi benchmarks. If you are on Jessie you may see this error, it is because of systemd. With init.d on previous debian releases samba restarted both smbd and nmbd, now it doesn’t. Now try to access the samba share, if all is well, repeat the process by editing smb.conf again and adding additional shares. NB: You may need to restart your device as well as any Mac or Windows machines you want to access the samba shares.